A bounty of new souvenirs that marry historical minutiae with modern sensibilities and technologies have left recent visitors to the Palace Museum delighted and bemused. One pair of earphones, when worn, dangle from the wearer's ears like a ceremonial necklace from the Qing Dynasty (1644-1911). A sunhat resembles the headgear worn by Qing ministers serving in the imperial court. Ballpoint pens look like imperial swords, and copybooks allow budding calligraphers to imitate the exquisite brushwork of ancient emperors like Kangxi and Qianlong. 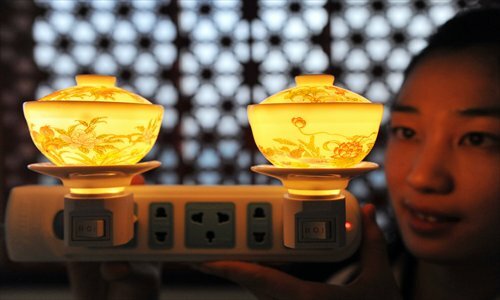 "The new souvenirs are very popular among tourists," said Wu Songping, a local tour guide. "They bridge the distance between imperial figures who lived in the past and people who are living in the present." A fan inscribed with notes from Emperor Yongzheng (1678-1735) caused one tourist in the gift shop to squeal in delight. "It's so cute!" remarked 19-year-old Shao Jing, a student from Heilongjiang University during a visit to the Palace Museum on October 26. The seven characters inscribed on the fan are taken from a letter that the emperor wrote to a subordinate, the governor of Henan Province in 1724. Written in plain language - a departure from the high affectation expected of emperors - the characters can roughly be translated as "That's the kind of guy I am." Shao explained to her traveling companion, a Russian classmate by the name of Nina Danilova, that the unpretentiousness of the words challenged the popular view of Emperor Yongzheng as a pompous tyrant. For those unsure as to what to buy, Wu recommended a notebook adorned of royal paintings of Emperor Yongzheng, outfitted in an array of ceremonial garments for hunting, fishing, and naval expedition among other official and pastime activities. "For foreign friends, I'd suggest buying the calligraphy copybook, which contains excerpts of Buddhist scripture handwritten by Emperor Kangxi, Emperor Yongzheng and Emperor Qianlong," said Wu. "An emperor's handwriting is extremely precious, and for hundreds of years, scrolls containing an emperor's handwriting was kept under lock and key, out of public view. Now, people can use them as models for calligraphy." On the Palace Museum's official Taobao store, the fan inscribed with Emperor Yongzheng's writing and the earphones which resemble a Qing dynasty necklace have already sold out. Beijing's Palace Museum is not the first to try to bring ancient history closer to the modern day masses through its souvenirs. Since last year, the Taipei Palace Museum has sold cello-tape with characters zhen zhidao le ("I understand") - the customary vernacular reply Qing Dynasty emperors would give to their subordinates. Recently, the Taipei Palace Museum has come out with a neck pillow that is designed to mimic the distinct knotted hairstyle of imperial concubines. Like the Taipei Palace Museum, the Beijing Palace Museum also has an abundance of little knick knacks which portray different emperors in chubby, cartoon form. Shan Jixiang, the curator of the Palace Museum in Beijing, told the People's Daily on October 30 that they will continue to make efforts to develop more creative souvenirs. "These souvenirs can serve as a carrier to transmit knowledge to the younger generation and make it easier for them to understand the culture and history of the Forbidden City," said Shan.